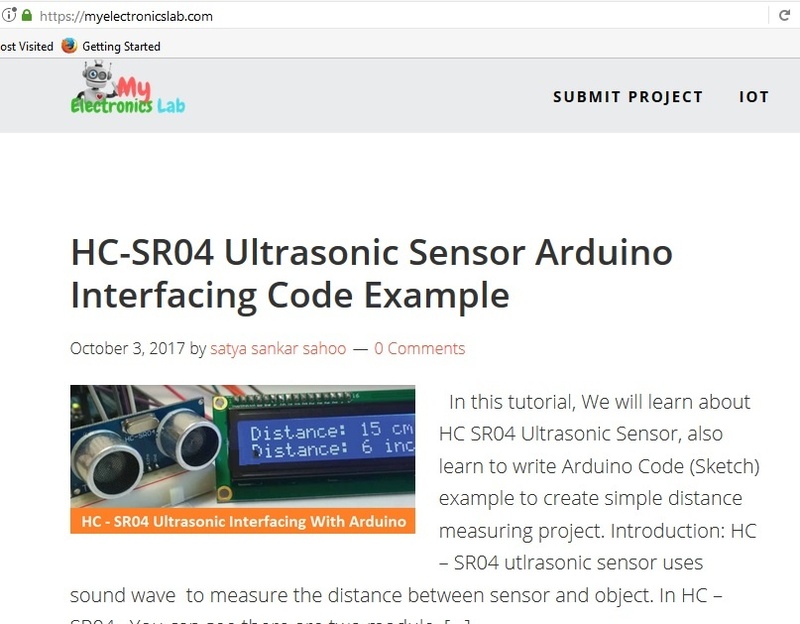 In this tutorial, We will learn about HC SR04 Ultrasonic Sensor, also learn to write Arduino Code (Sketch) example to create simple distance measuring project. HC – SR04 utlrasonic sensor uses sound wave to measure the distance between sensor and object. In HC – SR04 , You can see there are two module, one is Tx(Transmitter) and Other is Rx(Receiver). Tx sends ultrasonic sound wave and when sound wave get reflected by any object, and received by Rx, the module generate one voltage signal. which later feed to the Arduino. Working principle of HC – SR04 is pretty simple as normal IR+Photo Diode sensor. As HC – SR04 working in ultrasonic frequency range, there is no effect of sunlight on this sensor, that means you can use it on your next robot project easily to detect avoid obstacle :). In order to generate ultrasonic signal using HC-SR04, you have to give a High state to ” Trig ” pin for 10 us. Then Ultrasonic sound wave is sent via Tx module. If it is received on Rx module, then on Echo pin you will get one high state for some time, and here is you have to write the logic. Code for Interfacing Ultrasonic sensor HC-SR04 is pretty simple. Just connect TrigPin to 9 and EchoPin to 10. Rest code you can follow. Click Here to Buy HC-SR04 ultrasonic sensor module. The above code is very straight forward, you can find many library online , if you dont want to write your own code from scratch for HC-SR04 sensor module. I hope , you find this small tutorial useful. Do let me know in the comment section below, If you have any doubt.